I had a fantastic time presenting iPad resources and web 2.0 tools to Blue Creek School. They were a fun, interested group and have all of the requirements for really successful tech integration -- positive attitude, willingness to try new ideas, supportive administration and engaged community. I can't wait to hear success stories. In January 2014, I was invited to present at the statewide assessment conference in Helena. I presented to about 75 administrators and teachers in a room that comfortably fit about 50! It was a jam-packed. I shared about Three Ring, Confer, and Class Dojo as formative assessment tools. I was privileged to have the team from Highland School come to visit my classroom. We discussed classroom technologies, from audio systems to presentation tools to iPad apps. They were a great group to present to - fun people and kind listeners. A few weeks ago I presented about Three Ring (and consequently a few other apps) at the meeting of the district's 20+ elementary principals. The 10-minute presentation lasted an hour because they were so interested, asked so many questions, and had such a collaborative discussion (as a spontaneous response to the Three Ring presentation). I was and am humbled to have been a part of the meeting. The team of principals asked me to present Three Ring to the state-wide assessment conference in Helena this January and to our own board of Trustees. Of course, I said yes to both. I'll post more about these events after they happen. 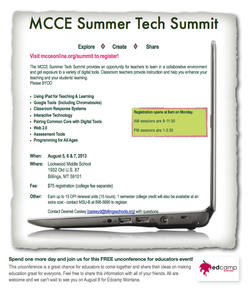 Over the summer (of 2013) I led two presentations at the Montana Tech Summit. I presented on the use of an iPad in the hands of the primary teacher. While there are many apps for student use, perhaps the most powerful apps enable teachers to teach in ways that were formerly impossible. (For example, the Reflector App allows me to write on my front board from the back of the classroom. I can actually be in two places at once now!! This is revolutionary, to say the least.) In addition, most teachers do not have multiple iPads, but they may have access to one. This teacher focus ends up being student-focused as teachers are enabled to teach the whole class while differentiating for an individual at the same time. I also presented on interactive whiteboards and how to make old practices, like calendar time, more interactive -- like linking digital content like YouTube and the Weather Channel. Interactive whiteboards bring about student engagement which drives achievement. McKinley School recently purchased about 20 iPads through the use of our Title 1 funds. These iPads will substantially affect student learning, IF the teachers learn how to implement them well. Since I'm passionate about technology, I've held a couple of presentations for my colleagues. We've discussed how to set up the iPads and how to manipulate all of the settings for safety and privacy for our students. We also discussed how to use the iPad as a whiteboard too. We have a few more sessions planned to disuss educational apps.